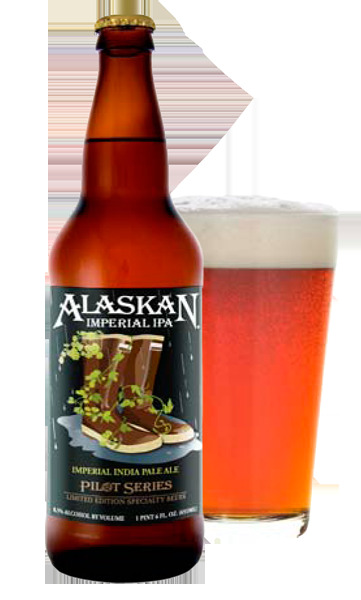 Press Release: Alaskan Brewing Co.
JUNEAU, AK – Alaskan Brewing is rounding out its inaugural year of limited edition Pilot Series releases with its first-ever bottled release of Alaskan Imperial IPA. This big and hoppy brew releases on draft and in 22 ounce bottles in early March in the 10 western states. Alaskan Imperial IPA is richly gold in color with the aroma of tangerine, lychee and other citrus over the toasted sweetness of crystal malt. The deep green flavors of Chinook and Amarillo hops partner with the fresh bitterness of Centennials for a complex hop profile. Other members of the specialty Pilot Series include Alaskan’s Double Black IPA, award-winning Barley Wine and Raspberry Wheat, which will make another appearance this summer. Alaskan Raspberry Wheat will be followed by Alaskan’s to-be-announced anniversary ale in celebration of the brewery’s 25 years of brewing in Alaska.